Don’t let the name “tartine” confuse you. It’s really just an open-face sandwich – plain and simple, but simply delicious as it combines the fruity goodness of melons, the unmistakable flavor of prosciutto, the irresistible texture of mozzarella, and (drum roll) that which makes it truly amazing… our Sourdough Baguette! Slice baguette into ¼ inch thick slices and toast or grill. Top each baguette slice with one mozzarella slice and artfully fold prosciutto and place on top. In a small bowl gently stir together julienned melons, mint and lemon juice. 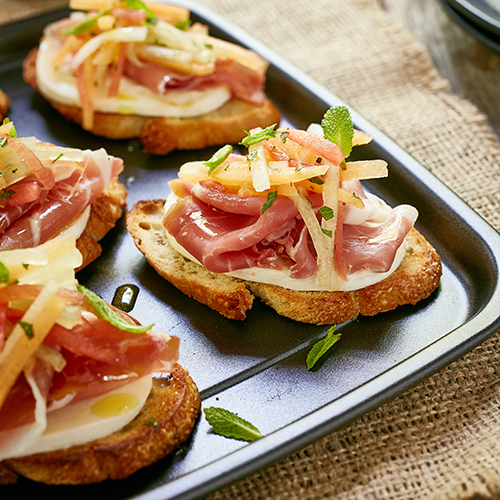 Top prosciutto with melon slaw and garnish with mint leaves. Serve and Enjoy!